Dr. Bleak received his dental education at Oregon Health and Sciences University School of Dentistry and graduated with a Doctor of Dental Medicine degree. An Oregon native, Dr. 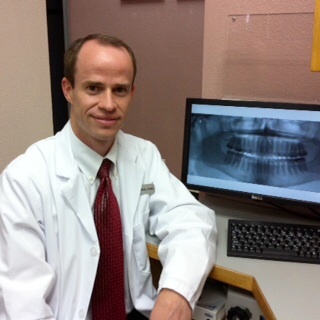 Bleak and his family fell in love with the Southwest while living and practicing dentistry in Farmington, NM. He has a passion for dentistry that began when he was 12 years old while working on the Dentistry merit badge under the direction of his Boy Scout Master who was a dentist. That passion has grown and matured since then. One of the aspects of dentistry that he enjoys most is the relationships he is able to develop with his patients. He says "Dentistry is all about treating people like people. I care for my patients as I would want to be cared for...in the most kind, gentle, and skilled fashion possible." Dr. Bleak and his wife have four beautiful children. Camping, fishing, church, Boy Scouts, and other family oriented activities are the focus of their lives outside of the office. He is very proud of his dental team. Each member of the team has been hand-picked according to their individual talents and abilities.